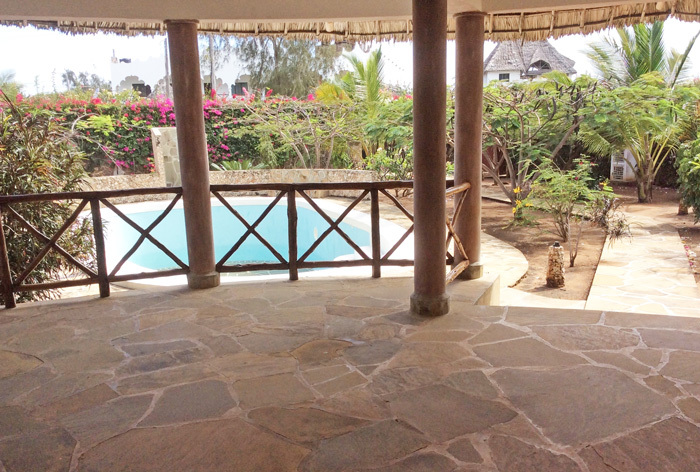 Set in 1,000 square meters of garden, this large two story, 4 bedroom house includes a swimming pool with pretty galana stone floor and lovely flamboyant trees. The entrance to the house is from the large open verandah which looks out onto the pool and garden. The ground floor inside features a kitchen, an additional room which could be used as either a bedroom or inside living/TV room, and a guest bathroom. On the second floor there are three further bedrooms, all with ensuite shower rooms. All three look out onto a large open verandah. The third floor is set under the tall, cooling makuti roof - an open plan space that could be used either as a lounge area or for additional bedrooms. The sea can be spotted from this floor. All of the bedrooms have sockets for air conditioning, ceiling fans, grilled & netted windows, glass louvers and cupboards. The property is on mains water and power, includes a generator house (no generator), laundry area and a single room staff quarters. Access to Watamu beach is via a public road alongside the plot.